A city holiday for old and young! Participate in an exciting city tour for parents and children, visit the famous zoo in Cologne, enjoy a bike trip along the Rhine - in Cologne, Dusseldorf, Duisburg and Bonn the whole family can experience numerous wonderful adventures! We are happy to welcome you and your loved ones at our DJH City-Hostels. 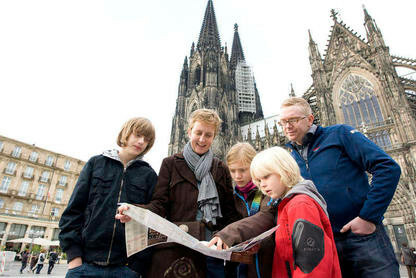 Located centrally but nevertheless quietly, our houses in Cologne, Dusseldorf, Duisburg and Bonn are the ideal starting point for young and old who want to explore the Rhine-metropolises. Whether it’s comfortable baby cots, modern bottle warmers or safe high chairs you are after - we've got it all! We love to care for families and their needs, and so this is part of our service. Parents and children likewise feel at home in our modern and comfortable family rooms at favourable prices. And with our various special offers we make your family stay even more attractive. When it comes to kids and family holidays, we are experts! Besides our family-friendly furnishing, our DJH City-Hostels have special leisure activities on offer for you. What about a child-oriented tour through one of the numerous, attractive museums or an exciting night-expedition through Cologne's famous zoo? It's our special offers and the child-friendly, informal atmosphere that makes your holiday not only relaxing but also an unforgettable experience for the whole family. This is why so many families choose us! 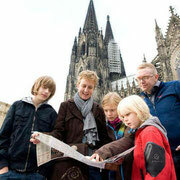 Family holiday at DJH City-Hostels in Cologne, Dusseldorf, Duisburg and Bonn: relaxation and adventure for parents and kids!